The day is finally here I can finally reveal the redo of our only full bath in our 1928 bungalow. This project has been two years in the making. As a reminder, it all started with this toilet seat. 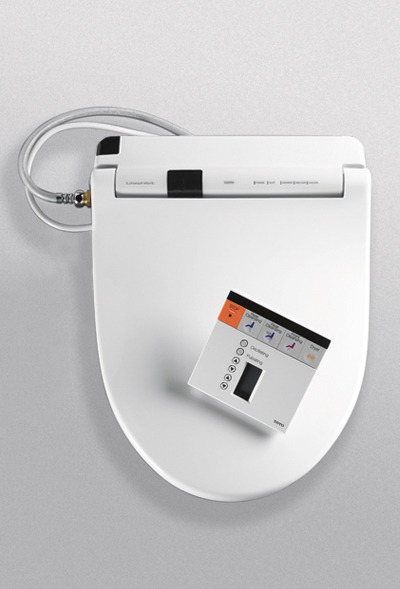 We won this amazing heated toilet seat with other features at a silent auction years ago. It had an elongated seat, and in order to install it, we had to get a new toilet. Well, one thing led to another and a section of our floor was ripped up. That was two years ago. Time went on, and we lived with the wood piece in our floor. However, along came Thanksgiving, and it was our year to host the entire family. We had to fix the floor because they saw the wooden piece in our floor two Thanksgivings ago!!! While we were at it, we decided to buy tile that would have been the type put in our house when it was built and to add a heated floor to go with our heated seat. We sort of consider them necessities rather than luxuries. It is Syracuse after all, and our average for this February was 9 degrees. We calculated exactly how long it would take us to do all of this, but we didn’t build in any time for problems. And we sure had problems. One thing led to another, and our DIY bathroom tile project was a total fail. So, after some time of pouting about it, we called in the pros. Welcome to the finished product. The contractors also added bead board which I was planning to do, but since they were already in there, I thought let’s go ahead and finish this. It is a tiny bathroom, and it is the only full bath we have. 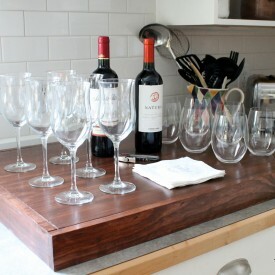 While, I would love to have double sinks and a makeup vanity, I realize this one has everything we need. Now with our heated seat and heated floor, this little room feels like our own personal spa. The cord going up to the outlet never bothered me before, but I am usually never looking straight on like I am for this angle to take a photo. I couldn’t be happier with the tile we used, We got it from Amazon, and so, it came right to our door. When mom came last week, she brought the old shower curtain from the guest bathroom since she just made a new one. I had to break out the sewing machine to hem the curtain but I was happy it was so long. She also brought the brand new rug. Even Yankee mentioned today he liked the yellow in the bathroom. We have tan towels, but I did find some white towels around and decided I need to go out and buy white towels for this bathroom. They look fresher than the tan and it is time to update some of my towels anyway. 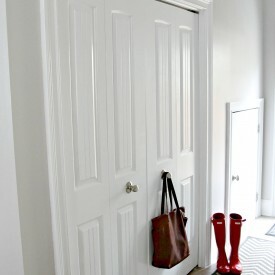 This above the door storage comes in so handy in this small room. It is still one of my favorite most practical projects to date. Even though it took two years I love the fresh/ more original to the house look for our bathroom. Would I do it again? Yes, in a heartbeat because having a warm toilet seat and warm feet are worth it. 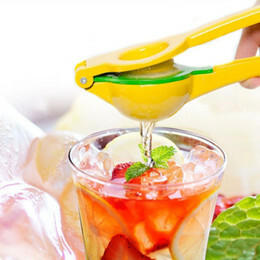 Do you have any luxuries that you don’t need but really do love? 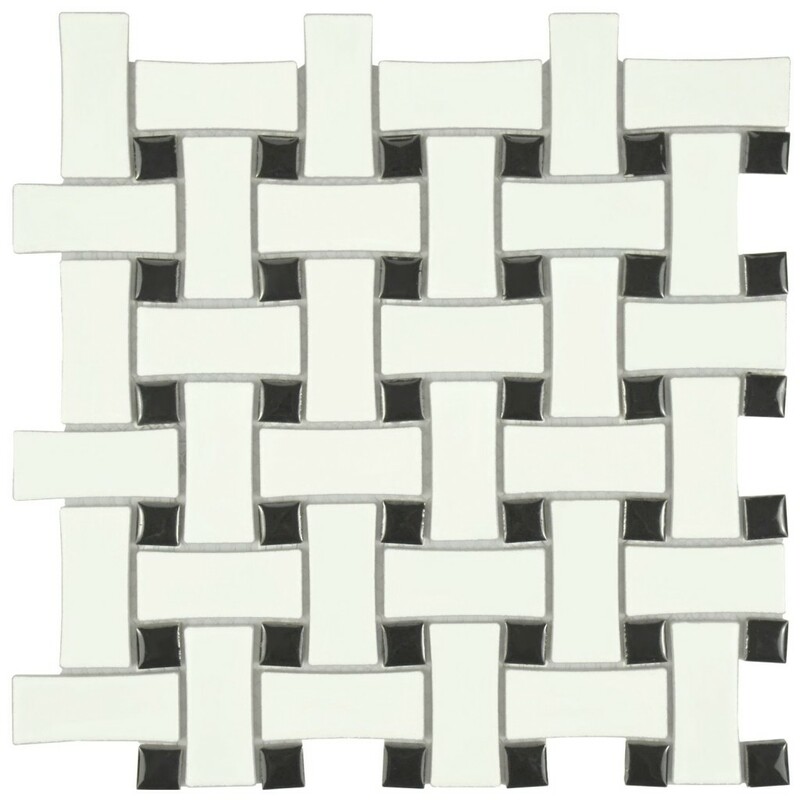 Linking to Wow Us Wednesday at Savvy Southern Style. Toilet seat picture from google. You said it best yes I am so thrilled and tickled pink. I smile every time I walk by. 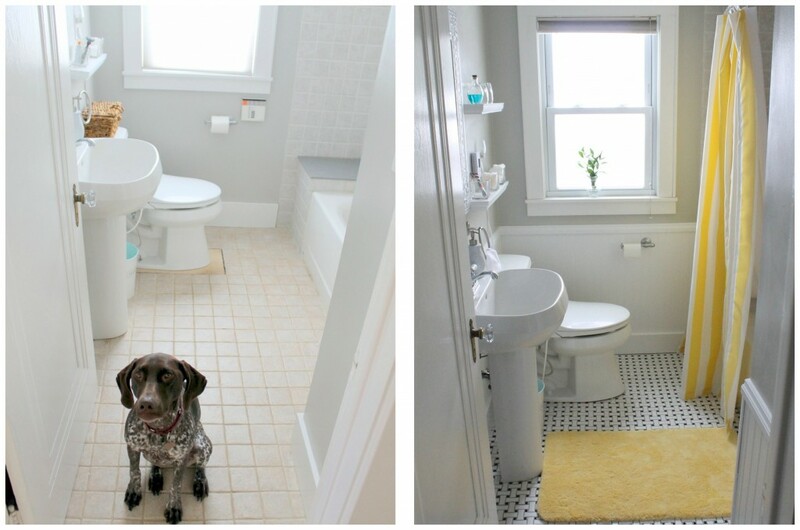 You did a wonderful job transforming your bathroom! 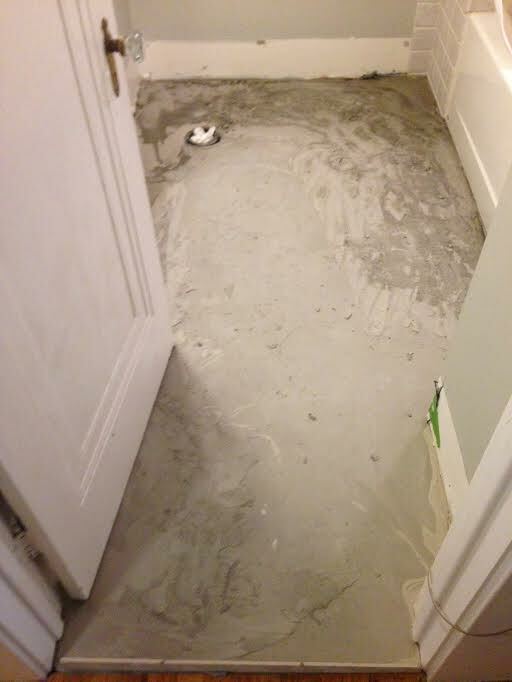 Our main bath in our 1921 Dutch Colonial has the exact footprint as yours and I wish I had your floors in ours! 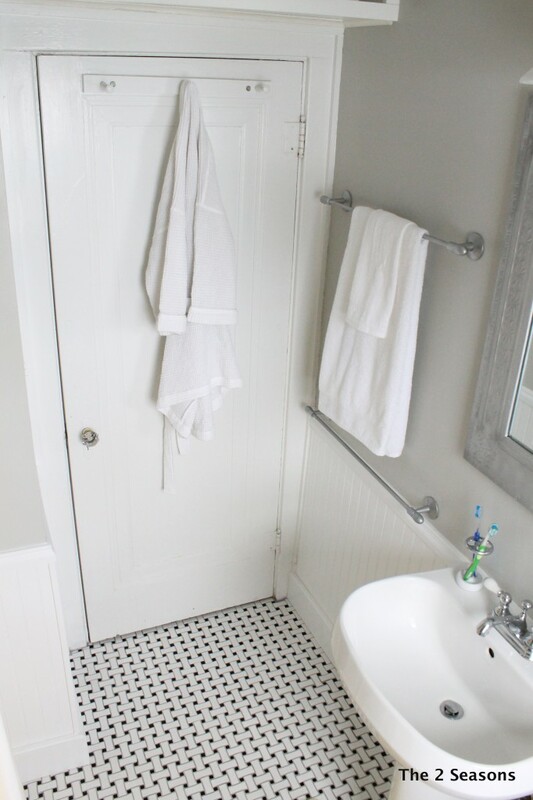 We had period black and white tiles installed in the bathrooms of our previous old home and I loved them. The heated toilet seat and floors would sure make me happy in our cold, cold bathroom! Visiting from SSS. We love Dutch Colonials – especially the ones built in the 1920’s. Thanks for stopping by. I actually wasn’t thrilled with the sink but it came down to space and a square pedestal would of taken up too much room. I agree now and I like the extra towel off space. Hi, I’m visiting from WOW and your photo caught my eye. Your bathroom remodel is so beautiful! I love that you brought it back to more original, and the bright yellow accents with the neutrals are so pretty together. 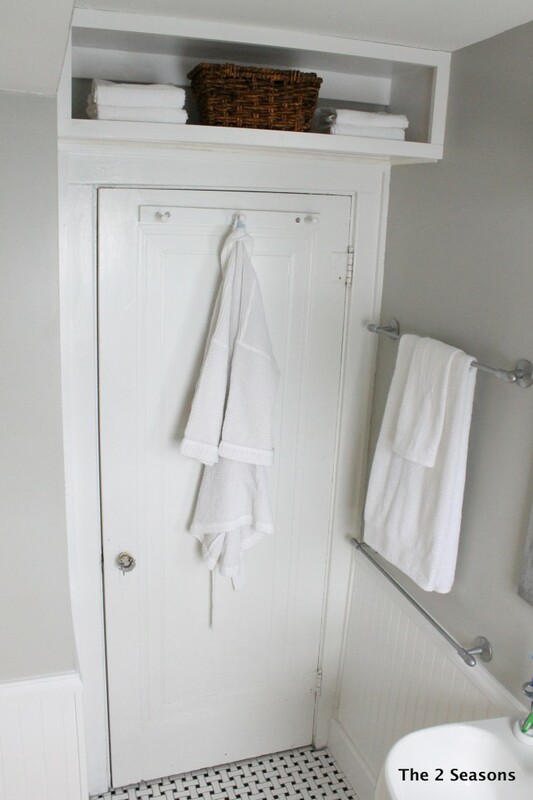 We are in the midst of a very similar bathroom remodel here, our cottage was built 1933. We can see the finish line. Ahh thank you for the sweet words. When we were looking at houses the majority had the original tile floors in the bathrooms and we loved them. Of course we got the one that did not so we are loving the new/old look. Bravo! It is done! What a sigh of relief and pride of accomplishment and improvement for you two. 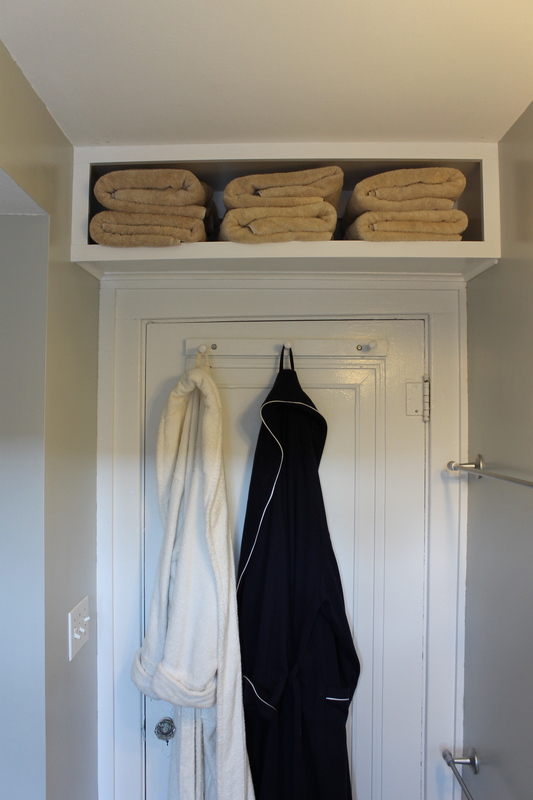 I am nearly certain that the overhead bathroom storage is how I first discovered your blog. I wish ours had a window too, but it is a smaller square footprint of a bathroom that we assume was added later. Yes such a relief I am so glad it is finished. 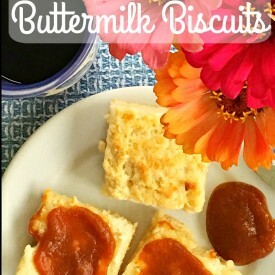 We are thrilled you discovered our blog! Love your cute bathroom. We used the same tile. I got ours at Floor & Decor. Love your pops of yellow. Thanks, Kim!!! I like yours, too!!! 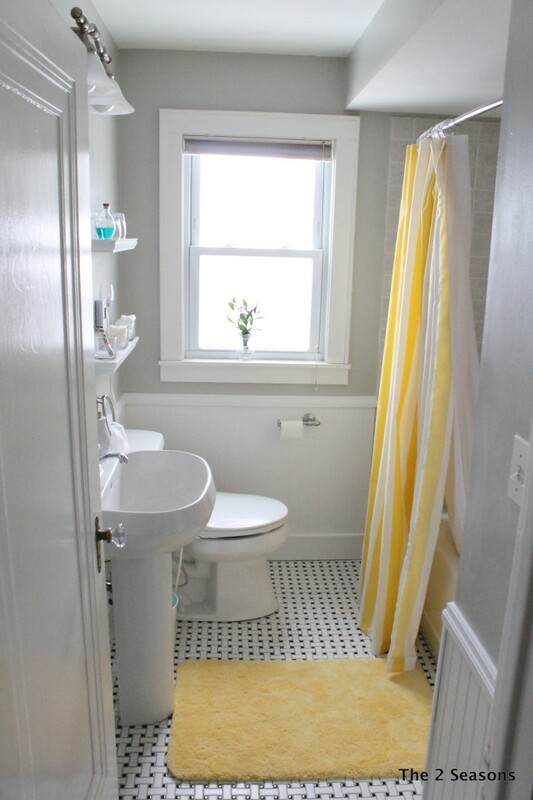 Your bathroom is so bright and cheery:) The floor is fabulous! 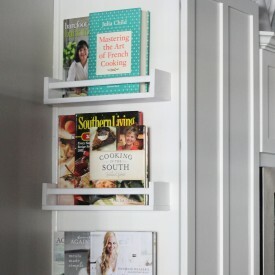 I think you may have started a trend with Kim over there at Savvy Southern Style;) Fab Job! Your bathroom reno looks so nice. I never tire of that tile pattern you have on the floor. I, too, have one of those fancy schmancy toilets and they are just end nicest thing… You don’t know you need one til you use one! Found you through WoW! Haha oh the toilets so you know how amazing those things really are in a bathroom! 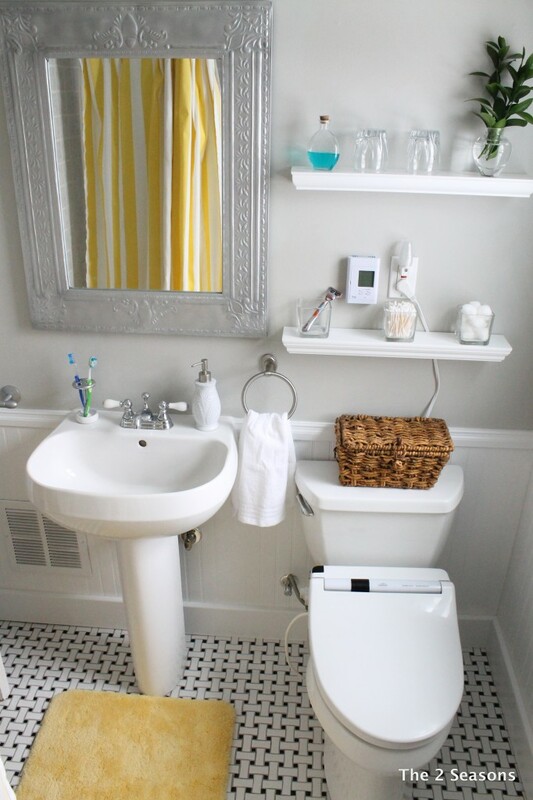 3 things here…I come from Richmond Va, where all the old houses in the city have bathrooms just like this with the black & white tile, so this makes me super home sick! I love it! 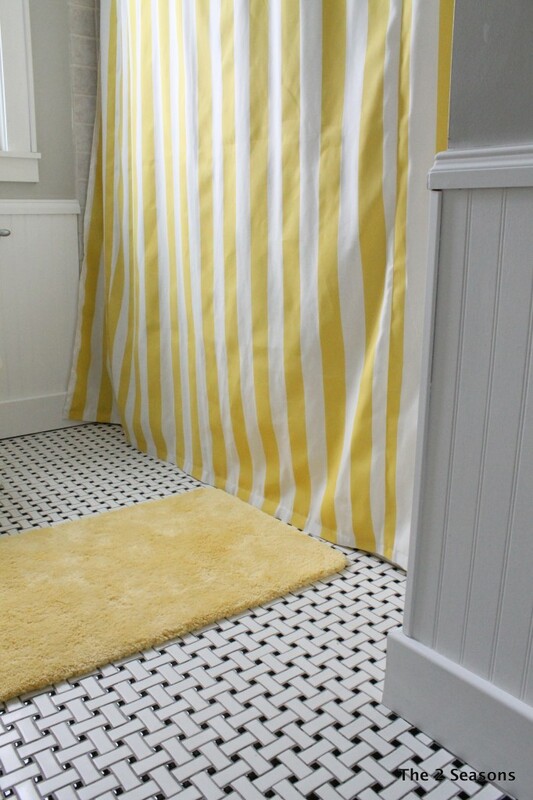 And after seeing your bathroom, I now want yellow in my bathroom! And you dog is too cute! Thanks for the kind words. 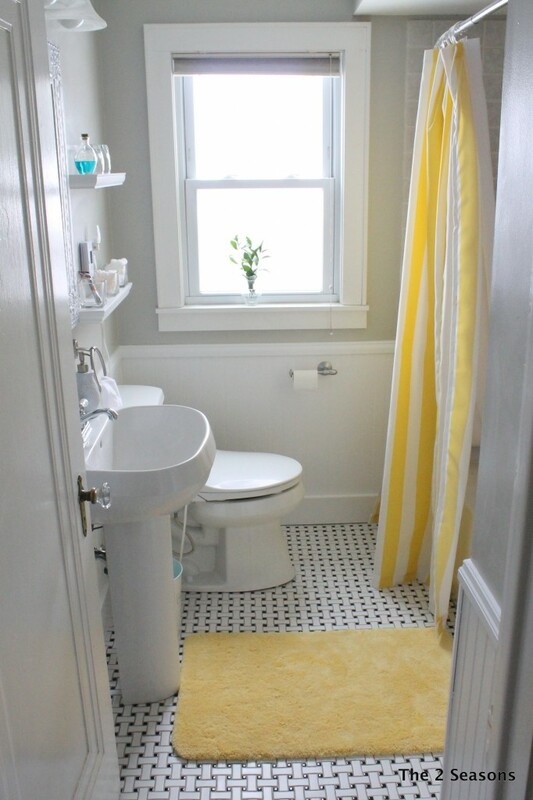 Go for yellow in your bath it is so fun and cheery!